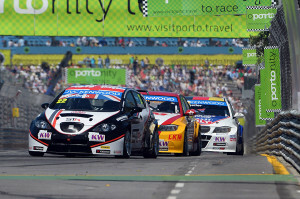 The team returned to Porto for rounds 13 and 14 of the WTCC with the car and engine issues fixed. After the extended break, Tom was eager to be back racing. Free practice 1 on the Saturday morning was an opportunity to double check the work carried out, and for Tom to get back to race pace driving. A few changes were made for Free Practice 2 and Tom was back on the pace. Lap after lap he was getting quicker and on his 9th and final lap he posted a time of 2:08:415s which placed him ninth overall. This was a great effort and things were looking good for qualification. For qualification the team followed a set plan. Tom went out on older tyres and set a time of 2:08:678s which put him in 13th overall. As the session progressed this position dropped. Tom came in for new tyres then went out to set a quicker lap. By turn 12 he was 0.3s up on his best lap time and was looking set for a time in the top 12. However, Hugo Valente, who Tom was following, had a slide in front of him, touching the barriers. Tom was forced to back out of the lap and could only qualify in a disappointing 18th spot. Things would be tough on race day with such a tight street circuit. Race One, and Tom was next to ‘local hero’ Tiago Monteiro in his works Honda on the grid. The large crowds were very vocal in their support for the Portuguese driver, and the grid was very busy. The temperatures were well into the upper 30 degrees and much hotter in the car. The first race with the rolling start got off well and Tom quickly made up places. Going into turn 6 he got on the brakes slightly late after avoiding the car in front and locked up. He missed the chicane and clipped the BMW of Bennani. He recovered though and by the end of the first lap was up to 14th and chasing down James Nash and Tiago Monteiro. Norbert Michelisz in his Honda retired and Tom was up to 13th. After 5 laps though, the brakes lost performance and Tom started to fall back from Monteiro. He was holding his own well against former team mate Darryl O’Young who was behind. With four laps to go, Tarquini had engine failure dropping oil on the circuit. A clean up truck was dispatched under yellow flags but a very unfortunate Franz Engstler was pushed into the said truck ending his race and forcing out a safety car. When the safety car went in there was one last lap to do. Tom was behind Monteiro and content with his position of 12th, P4 independent, when half way round the lap Darryl O’Young made a mistimed lunge up the inside and drove Tom into the barriers. The car was damaged beyond repair at the track-side, forcing the withdrawal of the car for race two, and yet again extremely bad luck hit Tom and the team. The team will now prepare for the USA round of the championship at the beginning of September.